Dinosaur Savings Bank. 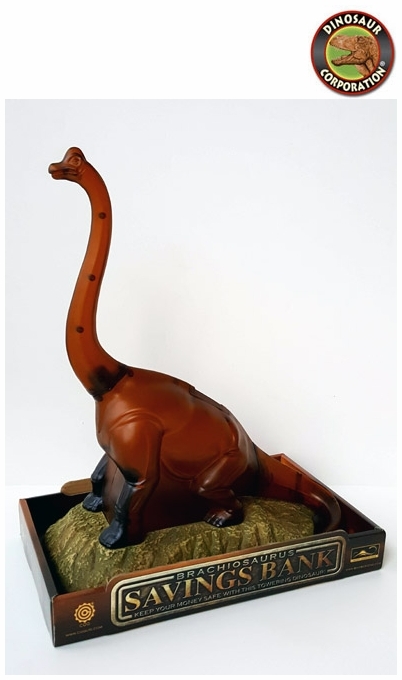 Keep your money safe with this towering Brachiosaurus. Drop a quarter, dime, nickel or penny into the opening of the dinosaur track and watch the money fall into the belly of Brachiosaurus. Features a plastic "Belly" that is opened by unscrewing the center bolt. Long neck dinosaur is sitting on the plastic stone like base. Great dinosaur gift-makes learning on dinosaurs to save fun!